Looking for a good utility knife for housework or your job? If yes, then have a read as my article can help you find the best utility knife for your needs. There’s nothing quite as satisfying as creating something with your own hands, and I think that’s the reason why so many people love cooking - it is the ultimate DIY activity. Another kind of DIY that’s very common, especially with guys, is related to making and fixing things around the house. To be able to do this, you, of course, need tools; usually simple ones. Having said this, there’s probably no single tool that’s more useful and versatile than a knife, but not just any old blade - I’m talking about a utility knife. Why buy a utility knife? What to know before buying a utility knife? In every household, there’s a lot of cutting going on, and some of these tasks are just too tough for scissors or pocket knives. This is where the utility knife jumps in. These knives have razor-sharp blades which are perfect for grunt work. For instance, you can use them to for usual day-to-day activities like cutting cardboard boxes, opening toys wrapped in plastic, slicing plastic bottles, an so on. 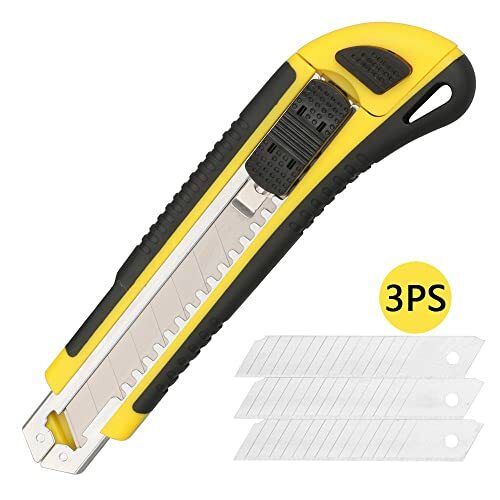 Those who live a more “handyman” lifestyle will find great value with these knives as they’ll be able to cut through thick materials like linoleum, tarps, roofing shingles, drywall - you get the picture. Heck, you’ll probably find more uses for them than I can think of at the moment I’m writing this! This option is usually not as sturdy as the other two but its advantage is that it’s more compact and more comfortable to carry in a pocket or strap to belt. These are often larger and sturdier than the folding variety and sometimes have more than one blade. They are great for rougher jobs but are a bit bulky and troublesome to carry around all the time. Fixed blade knives look more like traditional knives, and they are commonly used for some specific purposes like cutting or carving wood, drywall, shingles, etc. Those who need a knife for more general use should definitely go for a folding variety because it’s small, easy to carry, and can be with you constantly. Professionals who use utility knives for one or more specific tasks will be happy with a retractable model. These knives are bigger and more accessible to grip, so they’re more comfortable to work with for more extended periods of time. Also, they usually have extra blades in case that one goes dull. A fixed knife is best for those who do work with heavy duty materials and need a knife for one particular type of work. A utility knife’s blade length can go from two to six inches on average, and the ideal blade length for you depends on what you’ll do with it. For instance, slicing paper or cutting through drywall will require knives of different sizes, so make sure to think about the potential uses before deciding which one to get. As with kitchen knives, utility knives also come with different blade constructions, each more suitable for a particular purpose. 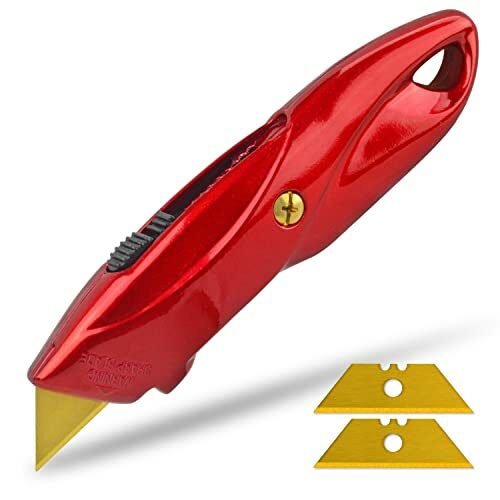 Straight blades - these are better for push cuts, and they provide more control, and accuracy. Serrated blades - optimal for slicing movements through tough surfaces, because the serrations grip and puncture the material with the high points of the blade. As the blade will eventually go dull, it is vital to have replacements readily available. In the case of retractable knives, many models have replacement blades stored inside the handle so they’re with you whenever you might need them. For folding knives, the spare blades are stored in separate containers. This is one of the most important considerations you have to make before buying a utility knife. Handles come in various shapes and sizes, and it is crucial to find one which feels comfortable in your hand. Also, the handle has to be just the right size because the one that’s too small will flip and spin once you grab it, and a large one won’t be easy to grip fully. Other important considerations include non-slip coatings such as rubber or silicone to provide a firmer grip. Finger grooves will keep the fingers in place, but they will make it uncomfortable to switch the position of the hand, so they are a double-edged sword. A D-shaped handle is the closest thing to one-size-fits-all regarding knife handles, so be sure to check it out. The safest option is probably the folding knife because when it is fully folded, there is no chance that you’ll cut or hurt yourself with it. The problem with retractable knives is that, sometimes, the locking mechanism isn’t very strong and tends to get loose over time, so the blade might slide out a bit while it’s in your pocket. The same goes for some types of fixed knives which also have sliders. Weight distribution is often overlooked, but a significant factor, because it determines the knives’ comfort level and ease of handling. Ideally, you’d want a blade knife which is perfectly balanced between the blade and the handle, as this will give you by far the most control.The second best option would be a handle slightly heavier than the blade. 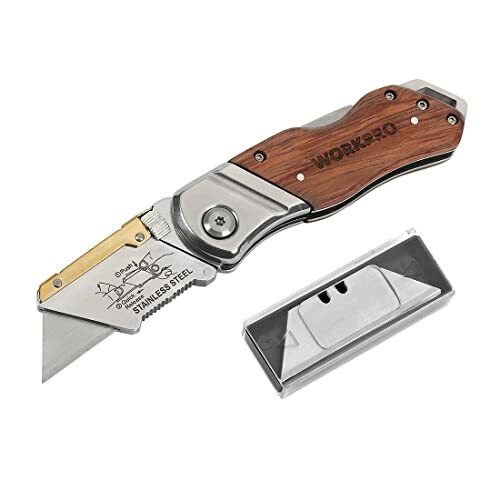 Besides having a beautiful look, the WORKPRO folding utility knife is, in my opinion, one of the best products of its kind right now. Let’s see what makes it so good. First of all, its size is ideal for both general as well as professional use. The handle has a lovely, rosewood finish and its shape is slightly curved so that it provides a more comfortable grip. Some customers complained of the wood finish not being very smooth, but this shouldn’t be a major issue. Second, the blade’s edge is straight, sharp, and gives an immaculate and accurate cut. It is rather short, so it’s not good for those who need to slice thicker surfaces. Ten spare blades are also included in the price and are stored in a small metal container. One of the main advantages of this knife is how easy it is to replace the blades, and it can be done in mere seconds. Last, the knife is relatively heavy which is a sign of reliability but might not be what some folks are looking for. The weight distribution is outstanding as there is a delicate balance between the handle and the blade. Are you looking for a tool for cutting cardboard, leather, carpets, and thin materials alike? Then do check out UtechSmarts’ retractable utility knife as it might be just what you need. At first glance, the handle looks like plastic, but in fact, it is made from zinc alloy, a durable material, and it has a protruding curve for anti-slip properties. As with most retractable knives, its dimensions are slightly larger than foldable one, but it’s not too big, and you’ll be able to grip it properly. The slider is used to push out the blade, and a safety lock is there to fix it into place. One complaint about this model is that the slider doesn’t operate smoothly in some units. The blades are made of carbon steel and have two sides, so when one becomes dull, you can just flip it and use the other one. Two extra blades are also included inside the handle which you have to unscrew to open. Overall, the knife is lightweight (177g), and since the blade is very short, it’s weight distribution is centered making it easy to control. Those who’ve found the blades of the two previous models two short have a look at Heikio’s retractable knife as it is an entirely different animal. The knife’s design is something that you’ll often see electricians or paper store workers use: a handle grips the blade and leaves it open on one side, so you can see it in its entirety. The handle is made from ABS plastic and has a slightly curved design for improved ergonomic features. The blade is 18mm long, straight, and around 80% of its length is functional. Its slider has an auto-lock system which will keep the carbon blade in place when you operate it. Be careful because it is very sharp and is ideal for slicing through thin materials. There are five replacement blades included in the price, but some customers said that they never received them. The back part of the product has storage for extra blades, and when it comes time to change them, it’s super simple to do. Heikio’s knife is light, affordable and functional, but it’s not something you’ll want to have in your pocket all the time. What’s better than a knife? Two knives! This is especially true for utility knives, and Orientools offers you a 2-pack at an incredible price. 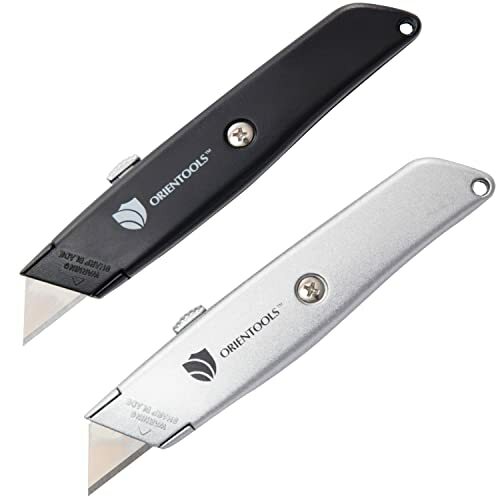 The package contains two utility knives, black, and silver, with a simplistic, sleek, design and an alloy zinc body. The dimensions of this model are relatively small for a retractable utility knife, which is indeed a benefit. The knives’ blades are made from SK5 carbon steel and can be locked in three different positions for cutting various materials. The positions are set using a straightforward slider and are kept in place automatically. The blade’s straight edge is sharp and will easily cut through anything from rubber to wood. Unfortunately, there are no replacement blades included in the package so you’ll have to order them separately. Also, there’s no clear explanation on how to change the blades when the time comes. Orientools product is pretty light and handling it couldn’t be simpler. It is one of the most fuss-free utility knives on the market, and definitely check it out if you’re into that. The last product on this list is another utility knife for handy folks who like their blades a little bit longer, and its name is - Dowell’s retractable utility knife. The construction of the knife is very similar to that of Heikio’s model, which is a prevalent retractable knife design. The handle is made from a combination of thermoplastic rubber and polypropylene so is has superior durability and non-slip properties. As for the blade, it is made from high-quality German-grade stainless steel, and it is very sharp and slightly flexible. The latter might be a problem when trying to cut sideways especially in case of sturdier materials. 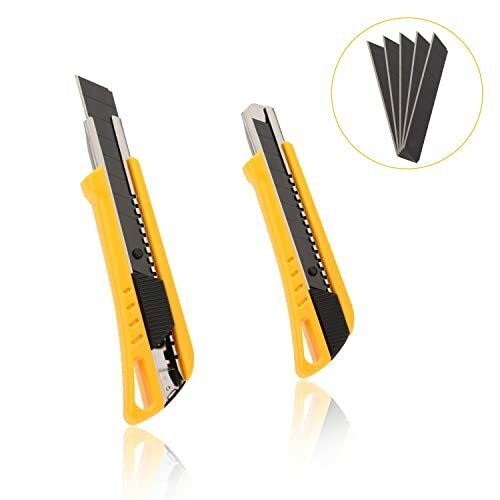 Other than that, the blade slices very well even though it’s very thin and it can easily be used for anything from drywall to roofing shingles. The blade is extracted/retracted by a slider and fixed with a locking mechanism. Some customers complained that, when not looking, they often confused the locking button to the sliding one as they are so close together. In the package, Dowell will give you three extra blades. So, dear readers, all good things come to an end and so does this article. However, we’re not finished yet as I first have to declare the winner of the roundup. After long consideration, I decided to pick the Workpro utility knife as the best in today’s list. My reason is simple - quality, quality, and quality. This is one well-built knife that should last you for years. The blades are sharp and dumb easy to replace, and the knife as a whole looks fantastic - way more stylish than any other similar product. Furthermore, since it is so compact, you can have it with you, in your pocket, at all times! This is a significant advantage, and it’s quite hard to do with many utility knives simply because they’re too bulky.